I was born in Cincinnati, Ohio in 1915 to Peter Kraushar and Anna Focht Kraushar. My dad was born from the union of Franz Kraushaar and Anna Hoefler and my Mom from the union of Stefan Focht and Susanna Huss. 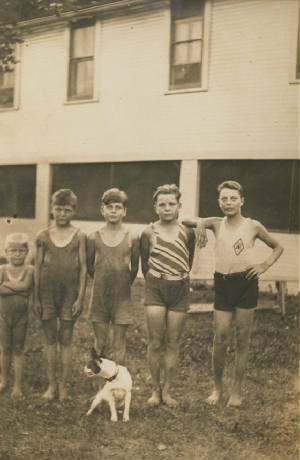 Stefan Focht migrated to the U.S. in 1908, worked for 3 years then sent for his family in Perjamosh, Hungary. My Dad, Peter Kraushaar came to the U.S. in 1909 from Hatzfeld, Hungary (now Romania) and worked as a barber in Cincinnati. Mom and Dad met at a "Unterhaltung", a german festival and shortley thereafter were married. I was the oldest of five sons. I was born in our apartment on McMicken Ave and Vine St in Cincinnati. By age four we moved to 603 Riddle Rd and I attended the Hopple Street school. Cincinnati at that time was well over 50% German. I started school in 1920 and my teachers name was Miss Stegner. I remember recess and playing leap frog,marbles and spinning tops. The school yard was divided into 2 sections, one for boys and one for girls. If you were caught in the wrong section you were paddled. I still remember some of the neighbor kids. There was Freddie Small who was the envy of us all because his dad bought him a pony that he would let us ride occaisionally. There was Richard and Amour Cook, the Settlemeyer boys, the Dittus boy, who on occaision would eat ashes, the Westerkamps and the Geis children On the corner by our house was a grocery operated by Mr Buddy and his wife. They would always give us a piece of candy when we bought groceries. I used to visit Mr. Osterhaus who owned a dairy and I would help him drive the cows from the pastures He delivered milk in his horse drawn wagon and I liked visiting him because he had alot of old stuff he brought from Germany that he would show me and tell me about. The field at his farm had a creek running through it which us kids dammed up and made a swimming hole. The bigger kids from Straight Street used to gang up on us littler kids and chase us from our pond and us it for themselves. One day we hid in the woods with our BB guns and once they got there clothes off we let them have it, they hooted and hollared and swore at us as they ran off but we got our pond back. Some of the clothes they left we tied into hard knots. We Riddle Road kids really had a good time together. We used to play marbles alot. The big white shooter marble was called a "Geestie"
I must mention more about Camp Washington. It contained the stockyards where I used to help drive cattle and hogs from pen to pen for Freddie Smalls father who was a cattle buyer. There was Taft field right behind Hoffner's Tannery. We played ball there and on Sunday went to watch inner-city baseball games played by adult teams. The tannery was where my grandfather Stephan Focht worked. Our teachers from Hopple Street school would take us down to Spring Grove Avenue where we would watch the Cole brothers Circus parade each year. The tents were set up in Cumminsville were we would go see the circus. During prohibition we lived at Marshall Ave and Riddle Rd. We lived on the first floor and Grandma and Grandpa Focht lived upstairs. Dad and Grandma had a partnership distilling illegal whiskey. They would deliver it to customers in dad's car. One of the customers snitched on Dad and Prohibition officers raided the house one day while I was at home. I was 7 at the time and they came busting through the door past me. There was only a little whiskey in a jar at the time in the house but the agents arrested grandman and dad and also confiscated Dad's car. As kids we also enjoyed Chester park, an amusement park out by the old Proctor and gamble soap factory. Us kids would go on the rides while all the adults drank beer and sang German songs. Near Knowlton's corner was another place where German people gathered called Reighert's park. There was a shooting gallery, bowling alley, beer tent, novelty booths and other forms of entertainment. Another memory is of Grandpa Focht working at the Hoffner Tannery. He worked long hours. I remember standing in the doorway watching him drag those big heavy cattle hides to the vats where they were soaked in a chemical solution, processed and turned into leather. Grandpa Focht died when he was 96 years old. 69 of those years he lived in the US and when he died he could only speak twenty or thirty words of broken English. At about five years old I remember our first Christmas tree. It was decorated with strings of cranberries, coloured ornaments and cut out paper dolls. Even though times were hard we still got presents on Christmas morning such as hard candy, aplles, oranges and we each got a small cast iron mobile toy. My Mom always made a huge Christmas dinner and she was an excellent cook. We eventually moved from Riddle Road to a house Dad had built at 3052 Taylor Ave when I was nine. It wasn't far and I still went to Hopple Street school. There were fields and forests behind the house where we kids would play, explore and have a great time. We would hunt small game and took the rabbits home to Mom and she would cook great "Hasenpfeffer" (stewed Rabbit). We also used to like to catch garden snakes for fun. Also we built a tree house. It was about 8 ft up. One day Mom said she would bake us an apple pie if we cleaned the yard, so we did. We took the pie up to the tree house and Marian Klein from next door came up and ate the pie with us. Afterward she was half way down the ladder when she got her dress caught and was stuck. She started crying so frank ran and got Mom who came and got her down When she got home and found out what happend her mom spanked her for playing with the boys in the tree house. The next day she stold me the spanking was worth it cause the pie was so good! Before Carl was born, when I was about 10 or 12, Uncle Steven, who was about 8 or 9 yeares older enjoyed teasing and aggrivating us younger kids to no end. One day he did that and the four of us ganged up on him and we all got a few good wacks and punches in. We didn't know that Grandpa Focht saw what happend from behind a fence. So he came out and whacked Uncle Steven right upside the head too! He never messed with us too much anymore after that. Brother Carl was born when we lived on Taylor Ave. There was a steep driveway and one day Mom asked me to watch Carl's buggy while she went inside for a minute. For some reason I got distracted and let go of the buggy and it went sailing down the driveway with Carl in it and me running after it. Mom came out and started screaming and running after it too. Luckily it did not flip over when it went over the curb. Mom spanked me and i had a sore rear end for days. Not far from us the "Little Sisters of the Poor" ran an elderly home. We used to go there and look through the iron gate and watch the nuns care for the old folks. Once in a while a nun would give us a piece of candy. Later Dad sold the house on Taylor Ave to move closer to his barber shop. We moved to Findlay Street between Race and Elm and Dad bought a big 3 story building and located the barber shop downstairs and we lived upstairs, and Dad rented out the other floor as a flat. Our saddest day was when our dear brother Matthew died of appendicitis. Mom and dad were out of town visiting relatives in Detroit. We were very close to Findlay Market so each year opening day of the Cincinnati Reds season was a big deal as the merchants sponsored a big opening day parade. We loved baseball and enjoyed watching games through the knothole and hanging around outside the park cause we could rarely afford to get in. The neighborhood was mostly German immigrants and the market had food stands of every kind, meats, cheeses, livestock, sauerkraut, hames, pickles. You name it. The Italians ran most of the vegitable stands. Between the Italians and the Germans it always seemed the market was in an uproar! Later i got a job at one of the Italian vegitable stands waiting on customers who were mostly German. I was told I was hired because i could speak german. I went to Woodward high school was strong in sports, attended dances and belonged to the Yomans club through the local YMCA. Here I made many good life-long friends. Times were tough and I had all kinds of jobs such as selling papers, caddying at the golf club etc. and money was tight because during the depression alot of men saved money by cutting their hair at home or not going to the barber as often. So all the money we kids made was turned over to Dad. Each Sunday though he would give us each a nickel and all of us boys wouold go to the movies. I had to quit high school and go to work, although I later finished high school by attending night school. I worked at Goldsmith Sporting Goods company as a leather machine operator. I was 18 now and the young ladies started to look real good to me.